Just 4 days after The One Pro race in Salem, Oregon, as part of The One Motorcycle Show, I was boarding an airplane to Milwaukee, Wisconsin for the next round of the National Super Hooligan Championship. 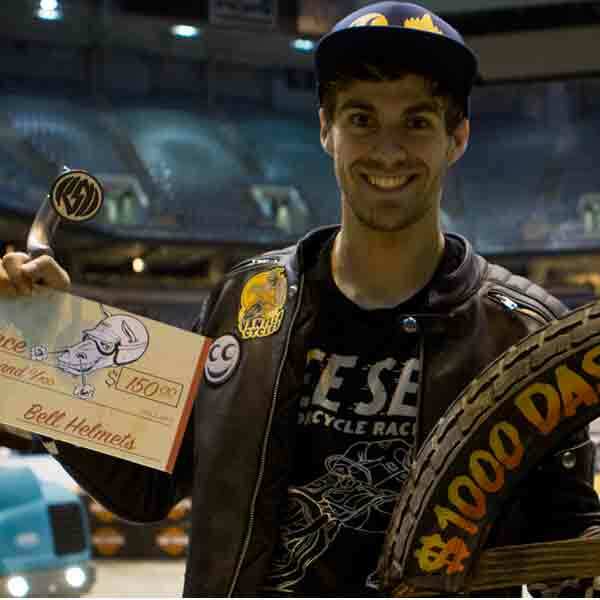 This event was called Flat Out Friday, which is a race in a large hockey arena put on by the Mama Tried Motorcycle Show. This was my first time racing indoors on polished concrete. And to make things more interesting, the entire track was sprayed with Coca Cola syrup to give it more traction. Backing it up a bit, I wasn’t able to find someone to haul the Harley-Davidson XG-750 that I’ve been racing to Milwaukee, and all the shipping companies couldn’t deliver it in time. Come Tuesday, time was running out and I had to try to find a bike to borrow there. I was desperate, and willing to pay a rental fee if I had to because I wanted to race so badly! I sent a few Instagram messages out to some other Super Hooligan racers. Hunter Klee of S & S Cycle in Milwaukee got back to me with the good news that he lined up a ride for me on a similar Harley XG750 to the one I’ve been riding. Though it was great news, then the nerves of getting the rest of the logistics lined up set in. Luckily Thor Drake of See See Motorcycles is a wizard and worked his magic to get Harley-Davidson to flip the flight bill and race entry, as well as the event promoter to set me up with a room in a fancy hotel! I checked a gear bag on the plane, and took my helmet bag as a carry-on. I was flying into the races factory style! Coke-syrup track was insanely hooked up. Practice went great, and I didn’t need to make any adjustments to the bike. The coke-syrup track was insanely hooked up. The track was small, tight, and hard to pass on. Getting into the first turn in first place was going to be crucial in the races. 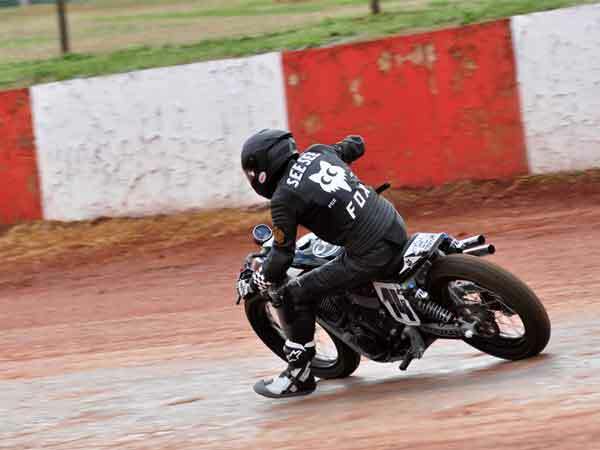 Instead of flat tracking with a steel shoe like flat track racers normally do, the hot trick was duct-taping carpet around your left boot to get the same sensation a steel shoe gives on dirt. I was so nervous going into my heat race. There was EIGHT heat races for my class, which was double what we had in Salem the previous race. Only the winner of each heat would go directly into the main event. So I knew I had to win to have a chance in the main event, and I had to win if I wanted to have a crack at the “winner take all” $1000 Dunlop Dash for Cash. With skill (or luck) I nailed the start, and came out of turn 2 in first place. I only had about 10 laps of practice, so every lap I continued to learn and progress. I easily won my heat race! A huge weight was off my shoulders. Now I could focus on coming up with a plan for the dash for cash. $1000 Dunlop Dash for Cash. There were some heavy-hitters in the dash for cash. 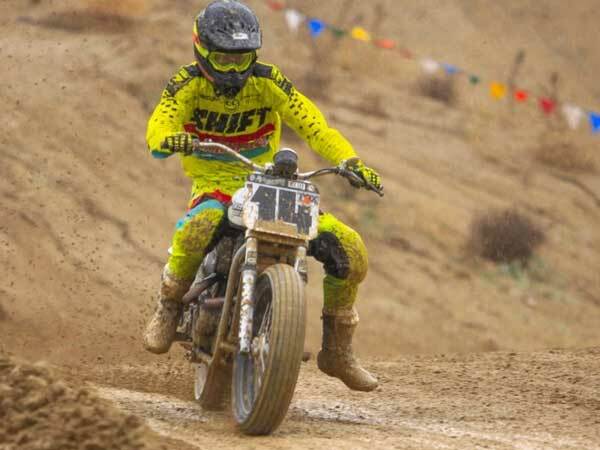 Benny Carlson for one, who was an ex-AMA Supermoto Unlimited Champion! 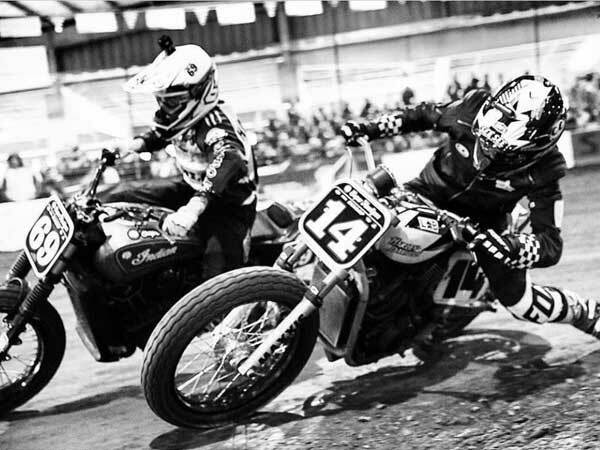 I used to watch him at the Supermoto races as an amateur, so it was cool racing with someone I looked up to as a kid. The line-up order was random, and I was placed on the outside of the front row, which wasn't an ideal spot. I got a decent start, and fell into line in 4th place. It was a short 8 lap race, and the battle was on! 4 laps in, the 3 riders in front of me all collided, with 2 of them crashing out. I narrowly missed, and now sat in 2nd place with a few laps remaining. A huge adrenaline rush pumped through me, and it took all I had to settle down and focus on trying to pass. Sure enough, I squared the leader up and made a pass on the last lap! I was able to fend him off and win the $1000 winner-take-all dash for cash! Oh yeah, there was over 8,000 fans in the stands cheering the whole time! It was an amazing experience doing that in such a confined area with that many fans. After the dash, I returned to the pits where the Vanilla Cycles ecstatically waited for me, as well as a representative from Harley-Davidson! There was lots of hugs and high-fives to be had. The anticipation for the Super Hooligan main event was through the roof. Once again, the front row line up of heat race winners was random, and I got an outside pick. I got a good jump, but came out of turn 2 in 4th. It was an identical start to the dash for cash with the same racers. This time it was a 12 lap race, which was still short, but I didn't have to go too crazy. With everyone in front of me trying to make passes, it made it very hard to set anything up. About halfway through, 2nd and 3rd battled so hard that I was actually able to pass both of them, and I now set my sights on last year's Flat Out Friday winner, Benny Carlson. I was faster and I closed the gap more and more each lap. But then the lap traffic set in, and it turned into an absolute free-for-all out there with bikes jammed up everywhere. I closed up right to Benny's rear wheel, but time ran out and I crossed the checkers in 2nd! I was very happy with the performance. In my opinion, it was a perfect night and I couldn't have expected it to be any better! I really didn't know what to expect going into the night on a borrowed bike on a track surface I've never raced on, and to win the Dash for Cash and get 2nd in the main event was pretty special. I also took over the National Super Hooligan Championship points lead! I want to thank Ryan of Vanilla Cycles for lending me his bike. It ran flawlessly, and I appreciate the support from Ryan and his crew! Huge thanks to Thor Drake of See See Motorcycles for lining the trip up for me. Thank you Harley Davidson and Scott of Mama Tried for the help as well. And last, thank you MotoShippers for throwing in a few bucks to cover my food. Next on the schedule for the National Super Hooligan Championship is American Flat Track in Woodstock, Georgia at Dixie Speedway! I need to start planning for that and figure out how I’m going to get there!